Welcome to 561 Selkirk Lane. This beautifully maintained home is located on the quiet and secluded eastern back edge of the community on a 4080sq ft perimeter lot. From the moment you step up on on the front patio you'll feel right at home. Interior layout offers the split bedroom floor plan everyone desires with the master bedroom on one side of the house guest bedroom on the other. Ideal floor plan for entertaining overnight guests. Master bath features walk-in shower guest bath has tub/shower combination. Spacious 200sq ft lanai on the front of the home offers an extension to your living space and filled with natural light. Soft color palette throughout the home. Covered patio off the back of the home to enjoy the Florida warmth. 60sq ft storage shed with washer/dryer. Price includes $40000 membership certificate. Located in award winning Maple Leaf Golf & Country Club a popular 55+ gated golf course community with an active resort lifestyle. 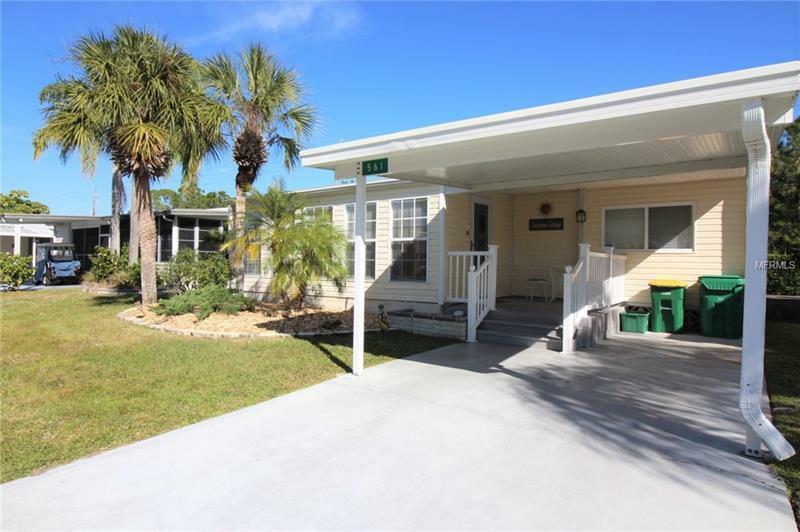 Features a Par 62 golf course5 tennis courts bocce ball lawn bowling 2 shuffleboard courts 4 heated swimming pools 2 hot tubs fitness facility woodworking facility 75+ clubs/activities 2 brand new pickleball courts and more. One dog or cat allowed at this location. Shown by appointment only 24 hour gated entry.